In defence of the designers, the grass snake is a classic Inter symbol, so there is s reason for it being there. But there’s something a bit naff about it, although I’m sure some people will love it. A good idea in theory but the actual shirt looks very naff. It will look so much better with the Scudetto and Coppa Italia winning emblems on it. 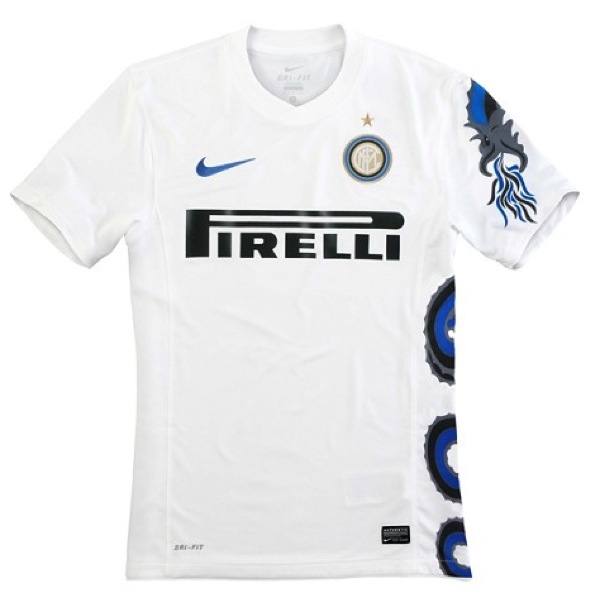 Nothing beats Inter’s centenary year away jersey though, cross St. Ambrose on it, one of Milan’s patron saints. I say hit. The idea’s a little silly, but it somehow works. At least it’s much better than I thought it would look based on the description. hah it looks like somthing out of SISQO’s closet .. i dont like it. They almost got it right. I think the snake should have continued on to the shorts finishing in the obvious spot! the picture shown is not great. the diagonal shot shows the full snake and it looks pretty tight to me. audacious but they gambled right! after winning the treble you’re allowed to wear whatever TF you like! Is it not a dragon rather than serpent?